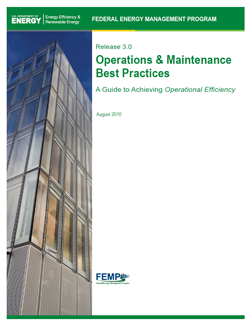 This Operations and Maintenance (O&M) Best Practices Guide was developed under the direction of the U.S. Department of Energy’s Federal Energy Management Program (FEMP). The mission of FEMP is to facilitate the Federal Government’s implementation of sound, cost-effective energy management and investment practices to enhance the nation’s energy security and environmental stewardship. The purpose of this guide is to provide the Operations and Maintenance (O&M)/Energy manager and practitioner with useful information about O&M management, technologies, energy and water efficiency, and cost-reduction approaches. To make this guide useful and to reflect needs and concerns, the authors met with O&M and Energy managers via Federal Energy Management Program (FEMP) workshops. In addition, the authors conducted extensive literature searches and contacted numerous vendors and industry experts. The information and case studies that appear in this guide resulted from these activities.